AMMONNEWS - Israel released 17-year-old Palestinian protest icon Ahed Tamimi from prison early on Sunday, after she served her eight-month sentence for slapping and kicking Israeli soldiers in front of her family home in December. 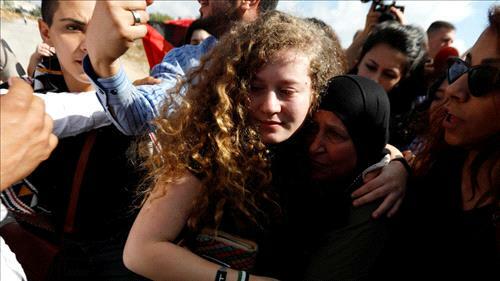 Ahed and her mother, Nariman Tamimi, were then transferred by the army to the Palestinians territories, where a festive homecoming awaited them in their hometown village of Nabi Saleh. Her mother filmed the incident and posted it on Facebook, where it went viral and instantly turned her for many into symbol of resistance to Israel’s half-century-old military rule over the Palestinians. With her unruly mop of curly red hair, the Palestinian teen quickly became an icon. In Israel, however, she is seen by many as either as a provocateur, an irritation or a threat to the military’s deterrence policy. In Nabi Saleh, supporters welcomed Tamimi home with banners and Palestinian flags planted on the roof of her home. Hundreds of chairs were set up for well-wishers in the courtyard. Her father, Bassem Tamimi, said he expects her to take a lead in the struggle against Israeli occupation but she is also weighing college options. Ahed was 16 when she was arrested and turned 17 in custody. Her case has trained a spotlight on the detention of Palestinian minors by Israel, a practice that has been criticized by international rights groups. Some 300 minors are currently being held, according to Palestinian figures.